LARENCORE: U.S : [CALL ACTION] Stop SALESFORCE from driving up deportations with CBP ! U.S : [CALL ACTION] Stop SALESFORCE from driving up deportations with CBP ! Salesforce is cashing in BIG on migrant children being torn from their families. Call 1 844-214-7947 -- Demand Salesforce cancel their contract with CBP. Last week, employees and community members protested outside of Salesforce’s (one of the nation’s largest tech company) headquarters in San Francisco.1 This comes just two weeks after 650 employees signed onto a letter to CEO Marc Benioff demanding an end to working with U.S. Customs and Border and Protections.2 But Salesforce refuses to shut down its relationship with CBP. Under the Department of Homeland Security, CBP is responsible for arresting, detaining, and deporting people who cross the U.S-Mexico border. With armed officers and high-powered technology, CBP, like ICE, has caused thousands of families to be ripped apart. Children as young as nine months old have been taken and locked in cages away from their families. That is why now is the time to increase the pressure on Salesforce to do the right thing : cancel the contract with CBP. The pressure is rising. There has been strong pushback against major tech companies from employees, activists, and consumers to drop their contracts and all ties from every immigration enforcement entity -- DHS, Department of Defense, ICE, and CBP. Back in April, more than 3,000 Google employees signed a letter asking the company to end its involvement in building surveillance programs.3 This led to Google severing ties with the Department of Defense for Project Maven. Pressure is already mounting against Microsoft and Amazon to end their contracts with ICE. Over 150,000 people, including Color of Change members, have signed petitions demanding companies such as Salesforce, Microsoft, Hewlett Packard, Thomson Reuters, Motorola, and Dell to cancel their contracts with ICE and CBP. A company like Salesforce that continues to defy its employees and consumers, needs to feel the pressure. The next step is to flood the CEO Marc Benioff’s office with phone calls. 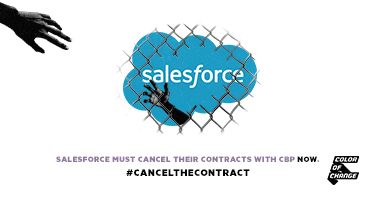 Salesforce needs to hear from all of us with one message : cancel the contract with CBP. Call 1 844-214-7947 to demand Salesforce stop helping CBP separate families at the border. When they answer you can read from the script below, or use your own words. Be polite and calm. While we might be angry, we need to send a consistent message that can't be twisted to discredit us. Hi, I'm [state your name] and I am calling on Salesforce to cancel their contract with CBP. As a leader in the tech industry, Salesforce has the opportunity to really embody the values that your CEO has been talking about in the news. Words are great, but these times call for resolute action from Salesforce. Salesforce must stand on the right side of history by deciding not to provide products and services for the bureaucratic machine behind the mass incarceration and deportation of immigrants. There are no excuses for enabling human rights abuses. Salesforce must cancel the contracts with CBP. In March 2018, Salesforce signed a contract with CBP to build custom software for hiring purposes. CBP is using a product called Community Cloud to “increase core human resources information technology capabilities for current and prospective employees, while at the same time, driving efficiencies throughout the process.” And CEO Marc Benioff recently tweeted that the company donated more than $1 million to end the separation of families. The company prides itself on the values of innovation and equality. But that is far from the truth. Salesforce must choose people over profits. Children's’ lives are now traumatized and harmed. Call Salesforce today at 1 844-214-7947 and demand they stop criminalizing families. 1. "Activists marched outside of the Salesforce headquarters in San Francisco to protest the company's contract with U.S. Customs and Border Protection," Business Insider, July 9 2018. 2. "Activists marched outside of the Salesforce headquarters in San Francisco to protest the company's contract with U.S. Customs and Border Protection," Business Insider, July 9 2018. 3. "Salesforce employees ask CEO to ‘re-examine’ contract with border protection agency" The Verge, June 25 2018.